Recently, I showed you how to create a staff intranet using the BuddyPress social networking plugin. The tutorial walked you through setting everything up, but your intranet won’t be a truly useful tool unless you populate it and manage it. So that’s what we’re going to cover today. In this post, I’ll follow on from getting your intranet set up and show you how to add users and groups to it, as well as adding extra functionality in the form of events and document upload. In this post, we’ll populate it and make it ready for the hard work of supporting youorganizationon’s staff. So let’s start by creating some users. For a staff intranet it’s likely that you’ll be adding users manually instead of expecting users to register. Doing this is as simple as creating users for your WordPress site. Go to Users > Add New and add each user as a subscriber to your site. You can choose whether or not to send them an email with a signup link: I’d recommend it, as it brings their attention to the intranet. Work through this process for each of your users in turn. If you’ve got a lot of users you can speed things up by importing their details from a CSV file. Install the WP Ultimate CSV Importer plugin and then import your users from a CSV file. You’ll need to set your CSV file up correctly with the required user data: username, email, and other fields you want to import. So now you have your users set up. Let’s create some groups for them. Groups will be the lifeblood of your intranet – they’ll support team activity and help people find exactly what they need on a day to day basis. As well as creating groups for formal teams you could also create groups for project teams and for clubs and societies in your organisation. These groups can then use the intranet to communicate amongst themselves, share ideas, files and progress, and create events for the group. 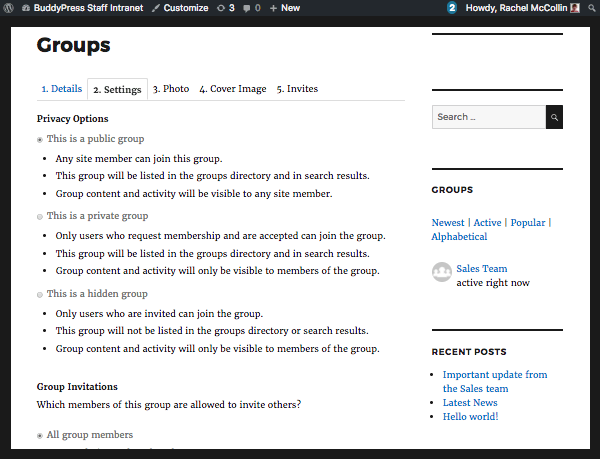 You create groups via the Groups page in the front end of your intranet. Depending on how you’ve configured BuddyPress, it’ll be possible just for the administrator to create groups, or any user will be able to create a group. It depends on how closely you want to manage this process. First you’ll need to enter the group’s details. Give the group a name and description, then click Create Group and Continue. You’ll need to choose what privacy level the group has, from one of three options: public, private and hidden. It’s likely that you’ll use private for most of the teams in your organisation, as they might not want other teams seeing what they post. But some groups (such as social groups or clubs) might be public. You’ll then need to specify who can invite other members to the group – all group members, the group admins and moderators or just group admins. For each group you can assign one or more administrators and moderators and it makes sense to give them this role. 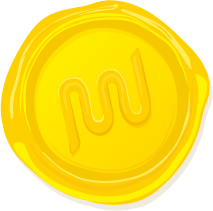 Here you can upload the team’s logo or another image that represents the team. Try and find a photo that fits nicely in the circular format BuddyPress gives you. Click the Next Step button to continue to the Cover Image tab. Here’s where you can upload a larger image of the team itself. Once you’ve done that, click Next Step again and finish off by inviting people to the group. You could either invite all members or just invite and create a group admin and get them to do it, which may work best of yours is a large organisation. Note: in order to invite people to a group you’ll need to be friends with them, so make sure you’re friends with all the group admins before starting. You can always invite them later if you haven’t done this yet, and once you’re done, you can unfriend them (if you dare). Finally click Finish to create your group. To change the images, click Manage and then Photo or Cover Image. 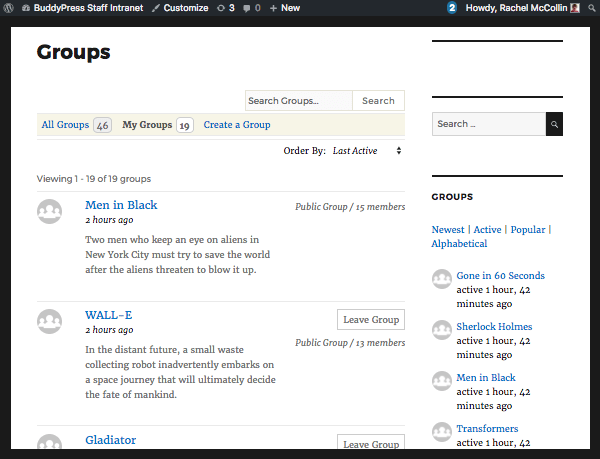 As you can see from the screenshot, there are two groups screens available to you: Groups and My Groups. Groups lets you see activity in groups you belong to plus any public groups, while My Groups just shows you the groups you’re a member of. This lets users see their own events (via their profile page) and events for groups they are a member of (via the group page). Before you start creating events, you’ll need to specify which user roles can add events. By default it’s just the site administrator. To change this, go to Events > Settings and click the User Capabilities tab. Here you can check the relevant capabilities for each user role. I’m choosing to let Subscribers create, publish, edit and delete their own events. If an event is assigned to a group, the plugin will only let the group admin edit the event or link it to the group. Note that to assign an event to a group, you use the Group Ownership metabox at the bottom right of the screen. You can only assign an event to a group that you’re an administrator of. Team members can then register for the event to show that they’re attending. Another useful piece of functionality is to add media upload for groups. You can do this using the MediaPress plugin. Install and activate the plugin as you normally would. Check the Group Galleries checkbox in the Component Settings section. Under Privacy Settings, select Logged in Users Only as the default, and make sure that’s checked as an option along with Group Only. Under Media Type Settings, select the types of media you want to include. Make sure Documents is selected. Under Storage Settings, edit the storage limits if you want to increase these. Now go to the Members Gallery and Groups Gallery tabs and make sure the same media types are checked in each case. Take some time to configure the settings to suit your intranet. As the internet is only open to staff members, you’ll probably want to enable more options than the default by checking the two checkboxes for automatically publishing media to activity streams. Now when you go to your profile page or a group page in the front end of the site, you’ll be able to add documents or media by clicking Gallery and then the Create a Gallery link. Click Create and you’ll be given the opportunity to upload as many files as you need. You can always add extra documents at a later date too. Finally, I’m going to add a site-wide notice. This is a tool you can use to make a message visible to all users of your intranet – useful for company news or urgent updates. As we added the Site-wide Notices widget to our sidebar in the previous post this will show up in the sidebar for all logged in users. When you want to add a new one, just repeat this, and to remove a notice, go to your message screen where you can delete your own messages. Simple! Your BuddyPress-Powered Staff Intranet is Ready to Go! Taking some time to get your intranet set up properly will make it easier for people to use it and make it more likely that they’ll find it a useful tool. By adding features such as events and media uploads you’ll make the site even more useful as a communications tool, and by creating groups at the start you’ll help people get up and running quickly. Have you set up a staff intranet before? What other modifications would you want to make for an intranet? Share your thoughts in the comments below.